When Facebook removed messages from the main app, I swore then and there that I would never download Messenger . That’s been a pretty easy promise to keep, especially since they introduced the lovely idea of enormous ads that take up half your screen while you try to use the service. Today Facebook redesigned them as part of a larger rollout — but fixed none of the reasons these ads are bad and should be destroyed. The ads may be “dynamic” as FB told me, but damn, look at the size of the things. They’re simply too large for the interface they’re invading, the image larger than any other element of the design. Even in the official video and images posted, the sponsored section takes up like two-thirds of the screen, and you better believe that’s the best-case scenario. Why so big? Did the ad department say they couldn’t sell anything that didn’t completely take over the app? Did they not want to ask for smaller assets after asking for ones at this size to begin with? Do they think people like ads as much as ad people do? At least now there’s only one ad instead of a series you’re invited to explore. I’m guessing engagement with the carousel was abysmal — who would think, hmm, not enough ads in my chat feed? To be fair, even good ads interrupt the user’s experience a little. But this is just way too much. As soon as you open the app, smack dab in the middle of the most-used main interface: an ad that takes up more of the screen than the content you opened the app to access. That’s intolerable. The idea that these ads resulted from putting people’s experience first is, of course, ridiculous. If Facebook were doing that, it would never have snipped Messenger off from the main app in the first place, much less burdened it with huge ads. When I asked again what the users’ feedback had actually been, I received no response. I also asked if users could expect to see ads just one time, or every few threads, or what — but no info on that either. We’ll find out soon, but I’m guessing they’re keeping their options open on that one. Is it possible to make ads that fit on a mobile screen alongside your messaging content? Sure! In fact, I would bet that Facebook looked at several designs that did just that and rejected them. When you visit a retailer online, you get a popup that says sign up for our email list and you get 10 percent off your first purchase. I’m okay with that. When I search on Google for “air mattress” I see sponsored results for items at Walmart before the rest. I’m okay with that too. When I read an article at Anandtech, I see ads for things like power supplies (well, also the Cooking Channel). Sure! Messenger’s ads have no context. They’re big banner ads that show up regardless of what you opened the app to do — and anyway, what advertisement could possibly make sense for the “asking a friend what they’re up to” use case? There isn’t one! The ads use the same targeting as other Facebook ads — no snooping in your messaging content yet. So if you’ve liked a bunch of retailer pages, you’ll probably see those, along with stuff in the same categories. That’s something, I guess, but who’s going to suddenly decide to browse men’s shoes at Timberland instead of responding to a message, which they opened the app to do? Messenger isn’t really a “free time” experience the way Facebook proper is — you use the former with purpose, the latter idly. Advertisements must cater to that, just like anywhere else in the world: you don’t see the same ads on subway walls (where you have to sit and stare) as on billboards (where you have two or three seconds max and your attention is elsewhere). 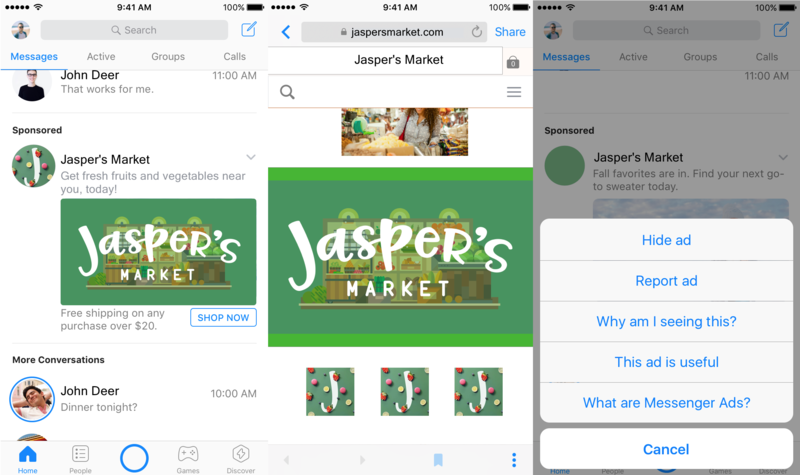 But if you don’t want enormous, intrusive ads prominently featured in your Messenger app, don’t touch them. Use the little dot menu at the upper right to hide ads. And don’t encourage them by selecting “This ad is useful.” Who does that?! Advertising is how things get paid for on the internet, including TechCrunch, so I’m not an advocate of eliminating it or blocking it altogether. But bad advertising experiences can spoil a perfectly good app like (for the purposes of argument) Messenger. Messaging is a personal, purposeful use case and these ads are a bad way to monetize it.